When there are casual gatherings, there are also formal ones, and most formal gatherings are usually held either to support a cause or to celebrate a memorable event in a person’s life. Another common difference between formal and casual gatherings in the presence of a program—a list of the order or flow of events—though there also a few casual gatherings that tend to utilize these programs. You may also see party invitation templates. One good example of a formal gathering is a banquet, which is commonly held during the evening just in time for supper. And since we mentioned earlier that it is almost always required that formal events utilize a program, banquets make use of them as well. The reason behind this program is to maintain an organized and smooth flow of the event. You may also see event invitation samples. However, here in this article, we are not talking about programs. What we have here are event invitation templates that you can use to inform people about an upcoming banquet and that you are looking forward to their presence on that said event. We have a large collection of templates that you can check out below, so don’t hesitate to do so. 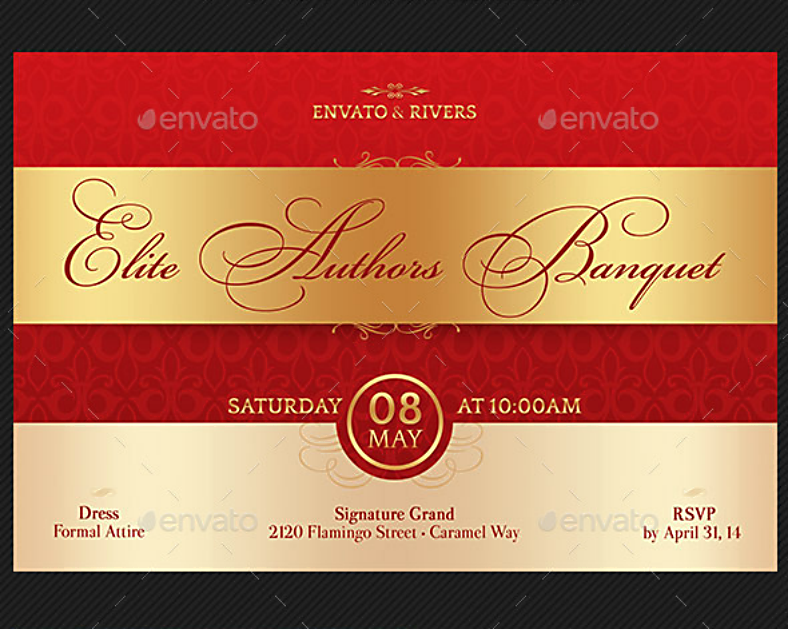 Red and gold definitely make a great pair when it comes to designs, and we’re sure you would agree with that statement just by looking at the invitation template above. Not only is that a perfectly artistic combination, but those colors make the template appear elegant enough and appropriate for the type of event regardless of the motif. Planning on throwing a banquet for children? No problem! The template above is ideal for those sports events meant to be played for kids, and you may even want to incorporate the Olympics theme to make it even more catchier. An annual harvest is an event that occurs at different times of the year depending on the country, the only thing in common is that it involves a lot of feasting and banquets of foods that were drawn from crops such as fruits and vegetables. If you are planning your own banquet and you wish to invite people to attend, the template above may be what you need. You may also see corporate event invitations. A dream for many high school girls is to become a part of their school’s cheerleading squad, and this requires a lot of discipline and skills. While many cheerleaders would want their squad to win at contests, just landing a spot on their team and getting recognized is already rewarding enough for them, which definitely calls for a banquet. If you are looking for formal invitation templates for banquets intended for cheerleaders, then why not consider using the template above? For similar templates, you may want to check out our collection of college party invitation templates. A banquet is a more formal term to refer to a feast or dinner event, and it actually is commonly larger than the other two-term synonymous with it. A banquet usually involves all meal courses starting with the appetizer down to the desserts, it will even include alcoholic beverages if the person so desires. A banquet is commonly held to serve a specific purpose which could either be a wedding ceremony, a celebration, or something related to charity or philanthropy. Oftentimes, banquets would even be preceded or followed by a speech or some speeches to honor a person. And, in most banquets, it may involve numerous tables with guests of around 8 to 10 assigned per table. What Are the Types of Banquets? This type of banquet is one of the most common types and is usually attended by a large number of people. Ideally, one or more buffet tables are used to lay out the various dishes, and the guests will need to pass through these in an organized manner to pick out what they want to eat. As opposed to the food that the guests will have to serve for themselves, the beverages are usually delivered and refilled by attendants. You may also see printable event invitations. This type of banquet is very similar to the buffet type, wherein the guests will have to serve food for themselves from a buffet table. The difference with this type is that it is usually preceded by a solemn ceremony. You may also see invitation card examples. Another type of banquet that is closely similar to the buffet type because this one also makes use of a common table where guests get their foods from. However, instead of the guests serving food for themselves, the food is usually served by food servers to allow for equal portions per guest. You may also see event invitation postcards. Also called action stations, this type of banquet involves different stations where dishes are cooked or prepared from scratch in front of the guest. Some of the most common food stations include Japanese food stations, meat carving, and dessert stations. You may also see dinner party invitations. Considered as the most cost-efficient type of banquet, this involves foods that are already portioned onto plates and brought to the guests who are already seated. The reason why this is the most inexpensive is that the foods have already been equally distributed among the plates assigned per table, thus preventing food from being wasted. You may also see printable event invitations. I know Christmas is still far away, but it never too early to start preparing for your Christmas party, most especially if you plan on making your own party invitations. If you are indeed planning on designing your own invitations, then don’t miss this once in a lifetime chance to get your hands on a beautifully-crafted Christmas invitation template. Although we know that soccer is one of the biggest sports all over the world, its popularity is at its highest in Europe. 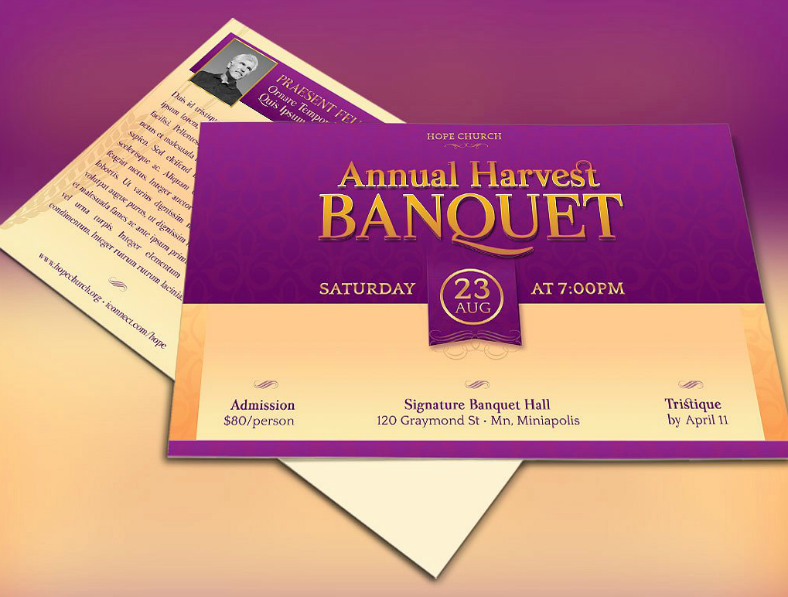 Check out the banquet invitation design template above which resembles a ticket. You may be able to use this template if you’re planning on hosting a banquet to celebrate the champions of a soccer tournament, a regular banquet to be attended by soccer players, or just a regular banquet which follows a soccer theme. Mother’s day has always been celebrated every second Sunday of May, which means it’s still a month away until Mother’s day. Nevertheless, it’s probably best that you start preparing for that day to really let your mom know how much they mean to you. 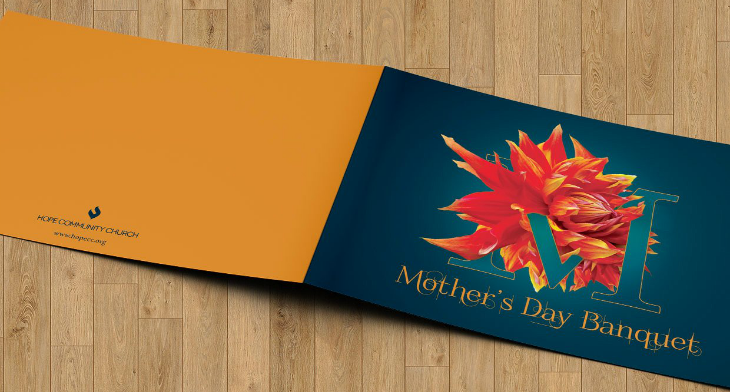 Make that day special for your mom or in honor of your late mother by throwing a banquet, and the invitation template above may be a perfect choice. For more plant-related templates, also check out our collection of leaves invitation templates. Are you planning on throwing a banquet in honor of a basketball player that you know? Whether they are a member of your family, a relative, or a close friend. Or are you planning to hold a regular basketball-themed banquet? If so, then check out the chalkboard-inspired invitation template above. To describe the appearance of this template, the entire card is divided into two columns, with the left half intended for the details of the event, and the right bearing a portrait image of the person being honored. An invitation is a form of tool or document—either in digital or printed form—that is used to inform people of an upcoming event, as well as letting them know that the host is actually expecting their presence on the day of the said event. Tou may also see PSD event invitations. To those who prefer to deliver their invitations by hand or send them through the mail, they can always go for the printed form. However, they can also choose to go for the digital or email format and simply send copies of their invitations through the internet. While the host of the event can simply invite people through phone calls or text messages, the use of invitation cards is considered as the most formal method, especially for banquets and other formal events. 1. First and foremost, as much as you want your invitations to be creative in order for it to stand out, always remember to keep it grounded and simple. But even though simplicity is the key to a beautiful invitation design, don’t be discouraged to incorporate some creative or artistic characteristics, just don’t overdo it to prevent your invitation from looking chaotic. 2. Don’t be afraid to use colors because they can definitely help in bringing life to your invitation’s design. Use vibrant colors and mix them up. To make it appropriate to the event, you may want to use the motif of the event as the color scheme for your invitation. 3. If you plan to use pre-designed invitation templates—such as the ones found on this website—add something personal on the invitation such as writing a personalized message expressing your heartfelt desire to have the reader come to your banquet. You may also see free invitation templates. 4. Lastly, do a little proofreading, most especially on the relevant details on the invitation. This way, you won’t risk misleading your guests to a different address or a different date. You may also see kitty party invitations. 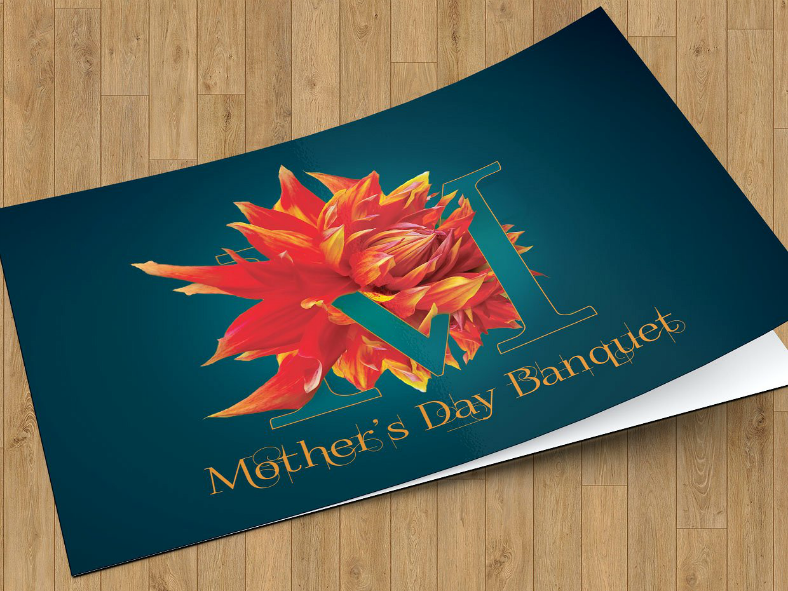 Here is another invitation template particularly designed for a Mother’s Day banquet, and if the previous one didn’t quite fit what you were looking for, this one might. As you can see from the image above, this template features a minimalist design with its solid purple background and a single, artistic symbol situated at the center of the design. 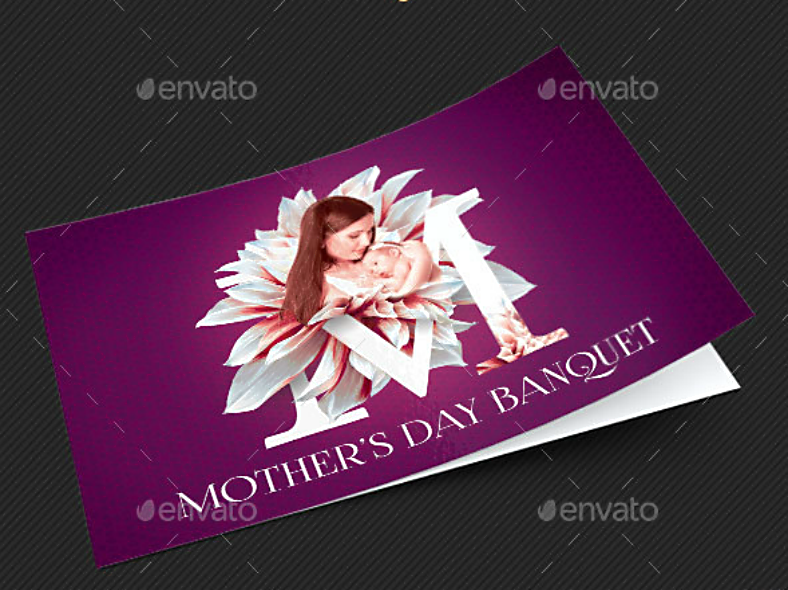 To go into details, the symbol in the middle features a woman cradling her baby, and around her is an image of white flower petals and a letter M which obviously stands for “mother”. If a rustic-themed invitation card is what you prefer, then you may be interested in the template shown above. This multi-functional invitation template is great for all sorts of banquet events, whether big or small. But the best aspect of this template’s design comes from its theme, and as mentioned earlier, this template makes use of a rustic look from its background to some of the textual elements. Even though this design focuses more on typography, it really doesn’t need the presence of graphical elements since the rustic texture of its background is sufficient enough in beautifying the look of this template. Let’s face it, not all couples can get reach fifty years, which is why it is such a privilege when a couple gets to celebrate their fiftieth anniversary. And since it is a privilege that comes only once in a lifetime, it definitely calls for a special banquet. 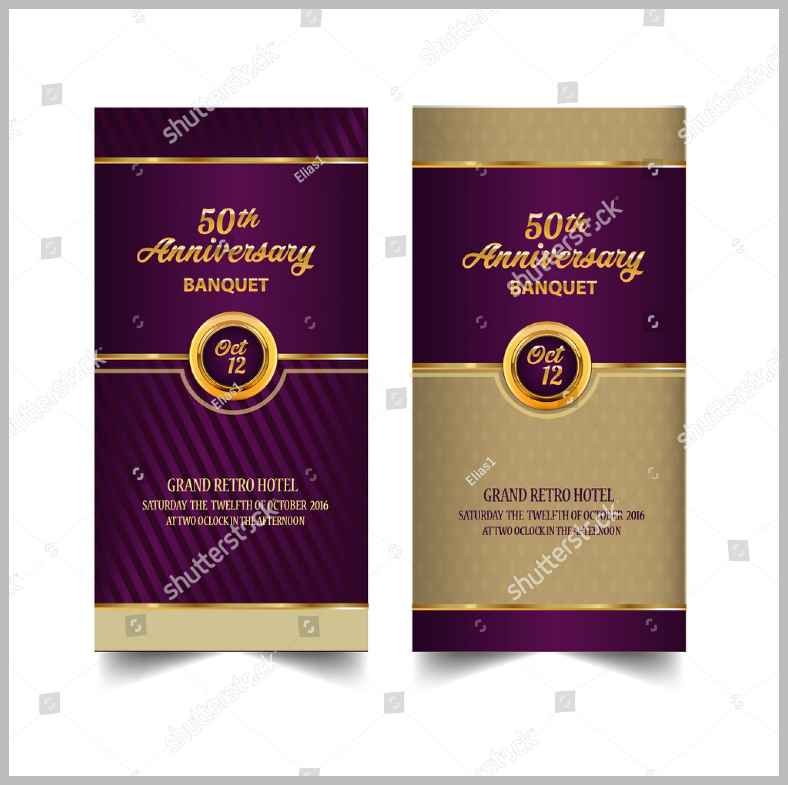 The anniversary invitation template above is intended for golden anniversary banquets, and to really make the design appropriate for the event, it features golden lines to go with the purple and brown color scheme. Earlier in this article, we showed you a soccer-themed banquet invitation template that resembled a ticket stub. Now, we have another ticket-inspired invitation template for you, but the difference with the one you see above is that it is intended for organizational gathering. But nevertheless, these templates are highly editable, which means that you may be able to use the template above to make invitations for all kinds of events. Did you like what you just saw? 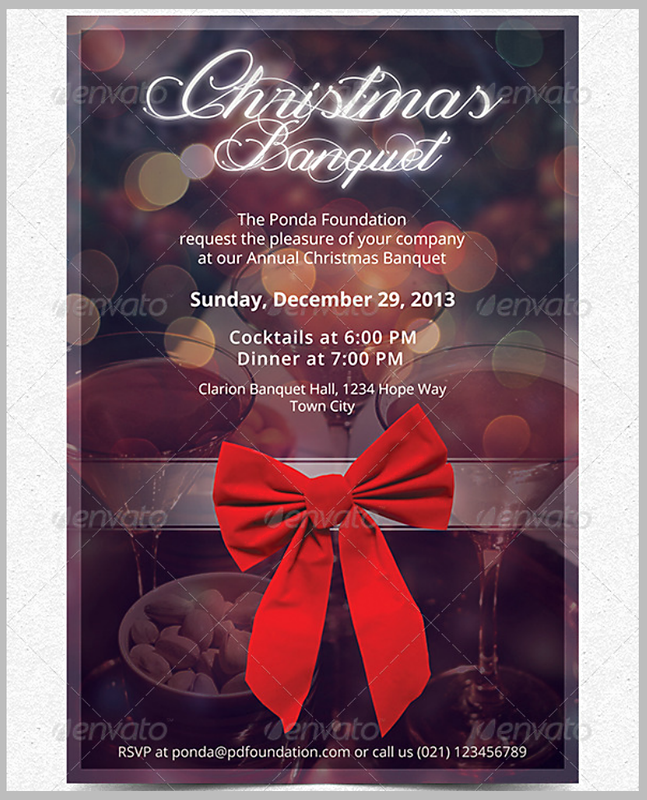 Did you like our banquet invitation templates? If you did but are unsure whether or not they are indeed worth downloading, continue reading on. The first thing that we can say about our invitation templates is that they were gathered from various reliable sources which offer more than just templates for invitations. With regards to who contributed these templates, they were actually designed and contributed by highly skilled graphic artists and designers. Now that you know that these templates were made by professionals, you may get the impression that they are expensive, but it is actually the other way around. These invitation sample templates can actually be downloaded for a very low price, and considering the quality that you will be getting, you may even say that you’ll be getting more than what you’re paying for. The last thing that you will need to know about our free invitation templates is that they are highly editable, meaning you are allowed to modify them according to your preferences. Additionally, you may even be allowed to edit the elements on the template individually. Even after so much modifications were applied on the design, the template is capable of preserving its own quality, which is a big plus. Now, do you think these templates are worth downloading? Because it’s about time that you start downloading a template so you can work on your banquet invitations.